A momentous day for iModelers. One of the truly great fighters of World War II, the P-51 was first flown today on 26 October 1940. At Mines Field, Los Angeles, California (now, Los Angeles International Airport), test pilot Vance Breese took the prototype North American Aviation NA-73X (NX19998) on a five-minute first flight. The US Navy has long had a tradition of initiating ‘Polywogs’ into ‘Shellbacks’. 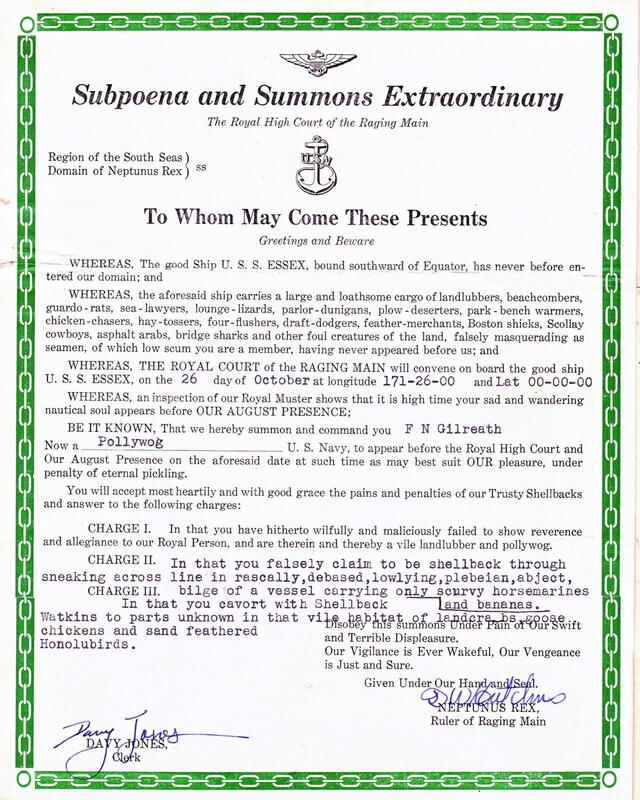 The ‘subpoena’ below was issued to FN Gilreath on October 26th, 1943 as the USS Essex crossed the equator. A stricken ‘kamikaze’ aircteft falling astern of the USS Petrof Bay, Philippine Islands, 26 Oct 1944. 14 responses to On This Day…October 26th. Now THAT is noteworthy (and it appears the tail structure was blown off of that kamikaze aircraft). Cheers, Craig. The kamikaze photo does give the sense of how desperate and depressing the tactic was. Get the b$%&^*d before he gets you. Happy birthday Mustang, indeed. A beautiful design that is beyond words – she is gorgeous. I agree. It’s right up there with the Spitfire and the Ki-61. Beautiful planes. It’s interesting that Essex would take time to do a Line Crossing, given that she and Bunker Hill were in a mad dash from Pearl Harbor to Noumea, to reinforce Halsey in the face of the oncoming Japanese Eighth Fleet’s attack at Bougainville. One could possibly take the longitude coordinates given on this and figure out where the carrier was when it crossed over. Isn’t Bougainville just south of the Equator ?? Personally, I think it shows the necessity of letting off steam and the importance of ritual in controlling fear and the unknown. We can laugh at the ancient gods but they do an important job in giving a little context through story and myth, especially if you are heading straight into a war zone. Excellent photos as usual………………… Thanks !!! Outstanding group, David! I’m humming the Happy Birthday song to the Mustang right now! IMHO…the greatest airplane ever built 🙂 thanks for posting this. Jim, I don’t think you’d get too many folks here arguing with you, even if they have their own favourites.